The biggest trend in business is the microbusiness Handcrafted jewelry, artisanal eats, life coaching, app development, you name it-entrepreneurial side ventures are everywhere. Weary of pink-slip anxiety and the endless money squeeze, millions of people are taking the leap. They're adding to their incomes and creating safety nets in case the ax falls at work. In the process, they're unlocking their creativity and finding a sense of fulfillment they never dreamed possible. Financial columnist Kimberly Palmer illuminates the everyday faces behind this growing movement, starting with her own journey. Recognizing that journalism offers little job security these days-and with a baby to provide for-she decided to develop a series of financial planners. This supplemental business was soon providing a reliable income stream. 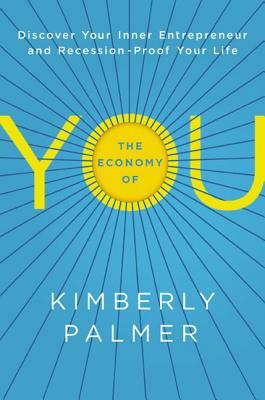 The Economy of You recounts story after story of people who-like Kimberly-are liberating themselves from financial strain. A deli employee who makes custom cakes at night. An instrument repairman who sells voice-overs on his website. A videographer who started a profitable publishing house on the side. Interwoven in the profiles are concrete guidelines for readers looking to launch rewarding businesses of their own, including: * Tips for figuring out the ideal side gig * Ideas for keeping start up costs low * Advice on juggling a fledgling enterprise and a full-time job * Strategies for finding your "tribe" and building a social network * Branding and marketing basics that bring results * When and what to offer for free * And much more Companies guarantee nothing but today's wages. It's up to YOU to build stability by becoming a money-making engine. It's empowering, gratifying, and easy to do with The Economy of You. KIMBERLY PALMER is senior editor and personal finance columnist for U.S. News & World Report. She writes the popular Alpha Consumer blog and is the author of a series of financial guides, Palmer's Planners, sold through her Etsy shop.